Energy ranging from 10kJ through to 25kJ. Typical compaction loads of 1200-2500kN. Higher Energy allows for a higher Maximum Dry Density at moisture levels below OMC, thus reducing water requirements during compaction. 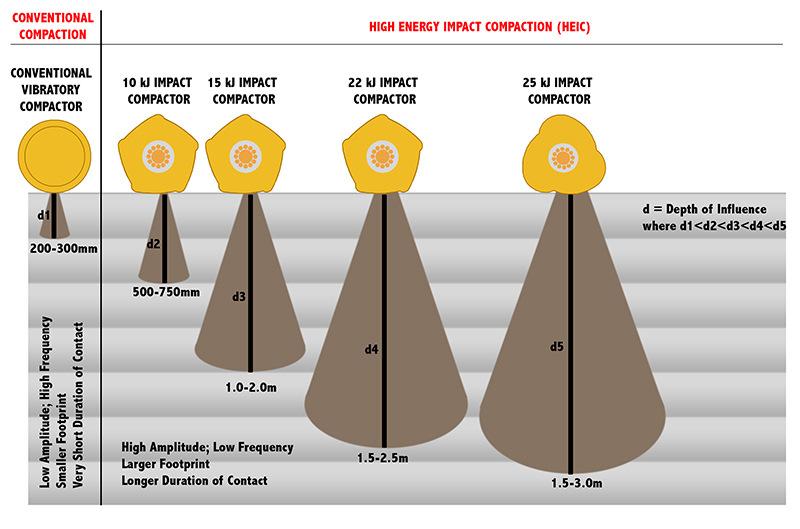 Higher Energy allows for compaction over a wider range of mositure contents. Impact Compactors operate at speeds of up to 5 times faster than conventional plant. Increased operating speeds coupled with thicker lift compaction allows impact compactors to compact up to 10 times more volume than conventional plant. Typically 7,000-9,200 m2 (8,300 - 12,000 yd2) per shift on layerworks. Contact Area is greater than that of conventional rollers. Load Duration is substantially longer than that of conventional rollers. compaction in thicker lifts resulting in a uniform density profile and increased production. 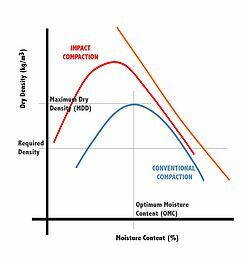 40-60% saving in Water requirements – the higher impact energy allows for the maximum dry density to be achieved at moisture levels below OMC. Compaction at 2-4% below OMC is possible. Increase the size of the layerworks from the conventional 150 and 200 mm (6" and 8") to between 500 and 1,200mm (1.6' and 4'.0). The net effect is an improved strength profile and increased production. 500mm (1.6') Layer: 7,500-9,000 m2 (9,000-10,700 yd2) per 8.5 hour shift per unit. 750mm (2.5') Layer: 5,300-6,500 m2 (6,300 – 7,800 yd2) per 8.5 hour shift per unit. Increased rockfill layers with HEIC not only improves the strength profile and increases productivity but also has the added benefit in that it reduces the amount of crushing required to reduce the maximum particle size. Increased rockfill layers allows for increased particle sizes, up to 2/3rds the thickness of the layer. The increased depth of influence in in-situ compaction may eliminate the need to excavate and replace material in thin layers. Potential reduction in design layer thicknesses, even complete layers, with improved bearing capacities achieved through deep in-situ compaction. Reduction in “black-top” thicknesses due to increased bearing strength achieved through deep in-situ compaction and improved compaction of layers. 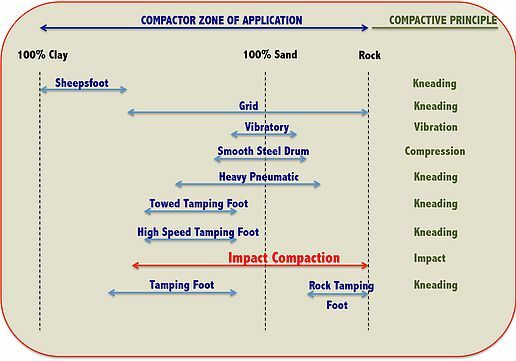 Compaction of a wide range of materials over wider range of moisture content. Improving existing on-site materials, eliminating the need to import expensive material. Employment of an improved quality control technique (CIR) resulting in improved accuracy and an increased number of correlated results whilst reducing the time required to test and the time required for results to be made available.